As some of you will remember, I’m a huge fan of The 7th Guest. Last year, the Trilobyte team made an attempt at a Kickstarter to make a sequel. Unfortunately, that failed. It might still come to fruition someday, but as a result of that failure, Trilobyte reached out to Attic Door Productions, the team behind The 13th Doll, a fan game that’s been in the works for years – since 2004, in fact. Trilobyte offered them a licensing deal, which is highly unusual for a fan game! The 13th Doll ties in with the events of The 7th Guest. A decade after Tad managed to escape the mansion, he is still haunted by the souls, dolls, and Stauf’s victims he left behind. So haunted, in fact, that the young man now resides in a mental institution – misunderstood, plagued by guilt and obsessed with one idea: to escape the dreary padded walls of his asylum cell, return to the mansion – the site of his innermost fears – to rescue those he left behind and defeat Stauf once and for all! This unconventional therapy attempt rapidly turns into a fateful journey, unravelling Tad and Richmond’s contrasting worldviews and leading the unlikely duo straight into a horrifying vortex of lies, illusions, lunacy and death. 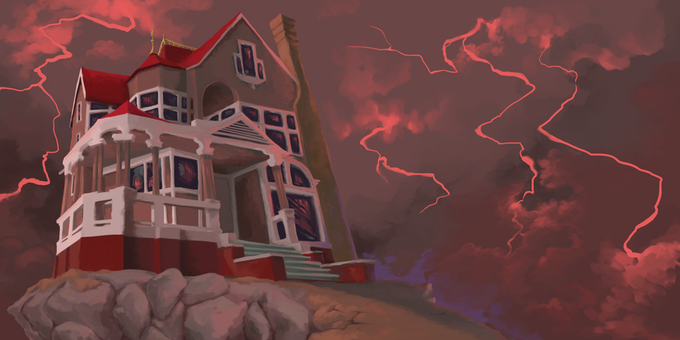 And soon a blood-curdling question arises: Have the two visitors really made their way to Stauf’s harrowing home on their own accord or are they mere pawns in a much grander, inescapable scheme? That sounds pretty cool to me! You’ll get to explore Stauf’s toy factory in addition to the asylum and the infamous mansion. You also get to play both Tad and Richmond, who will have two distinct storylines (and soundtracks! ), and the game features five endings. It’s being developed in Unity3D, which means you’ll be able to freely explore the mansion. And, of course, there are 26 unique puzzles to solve. Thankfully, the hint system from the first game will be back – and so will the FMV! I think the game looks amazing so far – they’ve recreated the rooms of the mansion perfectly. I reached out to the team to see if they would answer a few questions for me, and Ryan HoltKamp, the project lead, graciously responded! Kelsey: Who’s your favorite character from the original The 7th Guest? Ryan: My favorite character from The 7th Guest has to be Henry Stauf – he’s the perfect anti-hero. Started out down on his luck as a vagrant, meandering through life, and then built an empire out of the visions in his head. It’s the fairytale lifestyle that everyone dreams of. Well, except the whole evil thing, and killing children with a mysterious disease as they clutched his dolls and toys. Either way, Stauf isn’t just a cardboard villain, and I think plays into the success of The 7th Guest series. Stauf was relatable and human, and at some level a sympathetic character that took an evil path. Beyond that, I really like Hamilton Temple. A zany character with a good heart who wanted more out of life; he just craved the knowledge that that real magic existed, and sold his soul to be able to understand. I really appreciated his eccentricity, and the fact that he tried to save Tad, and was clearly a good guy – maybe the only one aside from Mrs. Knox. Kelsey: What’s your favorite location from the original The 7th Guest? Ryan: The foyer has to be the best location. It’s just hauntingly beautiful, and the scene view of the stairs from the front door is absolutely breathtaking. It’s been really fun recreating that scene. Kelsey: What’s your favorite puzzle from the original The 7th Guest? Ryan: The puzzle I remember most from The 7th Guest is the cake puzzle. It’s one of the first few you can play, and it just has an elegant charm to it. I love the audio clue; “Two skulls, and two stones… The rest is just icing.” It really sets the tone for the entire game. Kelsey: What are the team’s feelings on The 11th Hour? Ryan: I liked The 11th Hour – it was great to be back in the Stauf Mansion. But, it lacked some of the charm of The 7th Guest. The story, the atmosphere, the music, the bizarre ghostly occurences, The 7th Guest, in my opinion, just got everything right. In my mind, it’s a classic. That isn’t to say The 11th Hour isn’t a good game – it IS a good game, it just isn’t the classic that The 7th Guest was. I thought the visuals in The 11th Hour were fantastic. But, I didn’t like seeing the mansion in such a state of ruin. That’s why The 13th Doll is set right after the events of The 7th Guest; the mansion is still in generally good repair, though a bit more beat up than it was in The 7th Guest. Kelsey: A mental institution is a central point of The 13th Doll. Sometimes, video games aren’t the most sensitive about depicting these. How do you plan to address this with sensitivity? Ryan: Largely, I think we see the asylum patients from an empathetic perspective. Tad’s a victim there, haunted by ghosts and demons from Stauf’s mansion, and you’ll see things from his point of view. Dr. Richmond is new to the asylum, and he sees the patients’ obsession with Stauf as an inability to deal with the circumstances of life. These people have lost loved ones, and rather than deal with these issues, they’ve succumbed to insanity. Richmond enters the game with a bit of a chip on his shoulder there, but as the game progresses, he begins to understand where they’re coming from. So, largely, we’re treating asylum patients as real people, with real afflictions, both by seeing things through their eyes, as well as showing other characters finding a level of compassion and understanding with their afflictions. Kelsey: Are there roles for women in The 13th Doll? Ryan: One of the most prominent characters in the game is The Woman in White, who takes on a much bigger role in our game. I don’t want to give too much away, but she will be a huge portion of the game, and there’s a bit of ambiguity where her motives lie. We also show Nurse Vollmer, who’s a very kindhearted, compassionate person in the asylum. She begins the game as a sort of moral compass for Dr. Richmond. We also have a ghost girl, who haunts Tad in his asylum cell, and guides him as he plots his return to the Stauf mansion. Kelsey: What are some of your favorite horror films? Ryan: I can’t say I’m a huge horror buff, but I have to say I love the Nightmare on Elm Street movies back in the day, especially Freddy’s Dead: The Final Nightmare. I always loved the scene with the Nintendo Power Glove, for all its nerdy 80s glory. More recently, I liked Repo: The Genetic Opera – maybe a little too campy to be called horror, but it stars the lead singer from my favorite band OhGr. I also really liked Mama, but just about anything with Guillermo Del Toro’s name on it is worth checking out. Ryan: Well, we do have a pretty lengthy list of puns for the game. I’m kind of a sucker for nerdy humor that way. We should probably take submissions from fans; I think they’d probably really enjoy adding their own lines to the game. So far, I think we have three or four per puzzle. We’re planning to include 26 puzzles in the game. Thank you so much for taking the time to speak with me, Ryan!